Many of us remember Carlaw Park, legendary home of rugby league in Auckland for many decades, and the venue of many bruising tests fought by the Kiwis, and certainly we were excited to be involved with the freehold commercial development on 1.5 ha of the old 2.9 ha league ground. Believe it or not, 10 years have passed since the last test was played at Carlaw Park, and it has lain derelict for 8 years! This new development incorporates 10,000 m2 of office space across two linked buildings, 450 m2 of cafes and retail, Quest Hotel Apartments, owner-occupier apartments, and generous car parking. 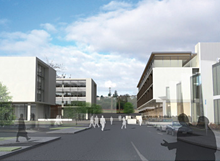 The buildings have been designed to the New Zealand Green Building Council’s four star rating. Intelligent Environments Limited were chosen by the electrical contractors to take responsibility for the design and commissioning of the lighting control in various areas of the core buildings, along with solar control of office lighting. The project is nearing completion.